Mastermind's fourth offering lies somewhere between melodic rock, hard rock, and progressive rock. Guitarist / songwriter Bill Berends plays and writes in a style reminiscent of people like Steve Morse and Eric Johnson — especially the Celtic rock inspired parts in "Jubilee" and "The Tempest." Throughout the album, the compositions are mostly open arrangements that leave plenty of space for the melodic guitar and midi-guitar lead lines. The Berends brothers stick to basic three and four beat time signatures, but provide depth and complexity in the tracks with unusual accent placement, harmony parts, and offset multiple melody lines. The sound can be quite interesting, especially considering that two guys did it all. Remember how you felt when Jeff Berlin sang on that last Bruford album? You'll feel the same way about the Mastermind vocals. He's not really singing out of key or anything, but... uh, did I mention he can shred on guitar?!?! At least he seems to be staying in his vocal range more on this album than the last one. Actually the coolest vocal parts on the album are the spoken "Thela Hun Ginjeet"-style mutterings on "Under the Wheels." Some of the low-pitched vocals, combined with the parallel fifth harmonies give some places, like the middle of "The Tempest," a haunting Devo sound. Much of the album is instrumental, so the vocals often aren't really an issue. The extensive tritone use, especially in "Under the Wheels" and "Until Eternity," is very suggestive of Anekdoten and King Crimson. With its shredding guitar, hectic changes, multiple parts, and sudden ending, "Until Eternity" (the title track, not necessarily the whole album) should really appeal to Dream Theater fans. If you like Dream Theater, King Crimson, and Eric Johnson, you're sure to like Until Eternity (the album, and the song too). Mastermind's calling card is the extraordinary talent of frontman Bill Berends, who composes the material and provides much of the sound, with his midi guitar and traditional guitar leads. 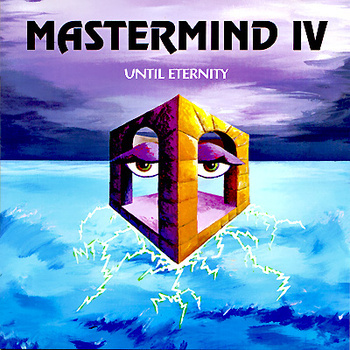 Mastermind's fourth album further develops the musical themes explored on the first three, with a few fresh new elements thrown in for good measure. The opening track, "Under the Wheels," has a great riff, spoken vocals, and a mesmerizing middle section. This track reminds me a bit of recent Rush material, as it combines a progressive structure and attack with a modern, state-of-the-art sound. Unfortunately, no other track on the album grabs me like the first one. The remainder of the album alternates between mid-tempo ELP-like instrumental sections and overblown ballad material. While the band's skill is formidable throughout, particularly Rich Berends’ drum work, the album never elevates beyond standard modern prog. My recommendation is to see this band live (I have twice) — their energy and dexterity come through much better in a live setting. The band has always had a very hard-edged, angry sound; this sound is best heard on stage. Overall, most Exposé readers will find this album impressive, if but somewhat lacking in engaging material. For their fourth album, Mastermind has carefully balanced all of their best tendencies within eight tracks of varying length, offering an album that captures the spirit of late-60s/early-70s rock living within the technology of the 90s. The brothers Berends have been playing these two forces off one another since their late-80s debut, but the sum of the parts have never before come together so well. As always, the playing is impeccable, but this time composition has taken a bold step forward, more concise and memorable overall. The material here is mixed between vocal and instrumental tracks — and while Bill Berends is not the world's most versatile vocalist, he seems to understand that and works well within the areas where he is most capable, his voice sharing an equal billing with the music in the mix. The album has considerable variety — "Jubilee" and "Inferno" are two shorter instrumentals, while the title track is a thirteen minute multi-part opus that stands very strong next to two similarly inclined efforts from the second album. "Under the Wheels" delivers a pessimistic and disillusioned view of modern society both in its music and spoken lyrics, and may be one of Mastermind's finest moments to date. "Dreaming" captures the essence of the quintessential 60s rock single, though how far that gets it in the 90s remains to be seen. Those who are not fans of the three-piece guitar/bass/drums sound pioneered by bands like Cream probably won't be won over by this either — even if the guitars do sound like keyboards sometimes. But overall, this is clearly Mastermind's most cohesive effort to date.